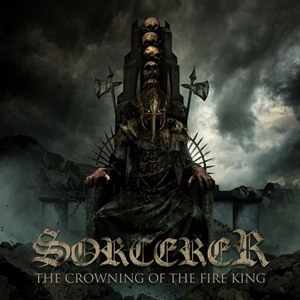 A victim of ‘wrong place/wrong timing’ stylistically in their first go around during the late 1980’s to early 1990’s, epic doom metal band Sorcerer is making the most of this second chance. 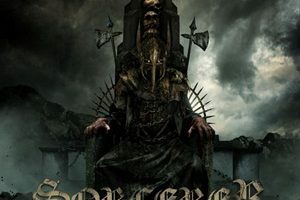 Signing to Metal Blade and releasing their debut album In the Shadow of the Inverted Cross in 2015 to critical acclaim, many in the metal realm seemed surprised that this quality unit never got their just accolades. Thankfully, founding member Johnny Hagel (most known in Tiamat) and vocalist Anders Engberg felt the Sorcerer book hasn’t been fully written, and here we are for the second full-length. Now comfortable within their own skin (as the current twin guitar team of Kristian Niemann and Peter Hallgren have been together since 2012), the fruits of their labor make The Crowning of the Fire King an immense record that intoxicates, delights, and penetrates in the best manner possible for the body and soul. It’s all about the combinations of the almighty riff and pairing it to the requisite vocal melody – and Sorcerer connect time and again throughout these eight tracks on both fronts. Reference points for the band’s approach and doom ethics certainly embody a healthy amount of Black Sabbath and Candlemass – but for the former, it’s the Dio and Tony Martin-periods that matter more than the 70’s version of this classic outfit. The accents for Niemann/Hallgren out of the gate for “Sirens” allow Anders resplendent, mountain-top range to ring for the heavens, conveying adept smoothness in multi-octave low to high peak abilities. Longer instrumental set ups and transitions are part of epic doom charm and lore – the brain hanging on slower, effective spots, which you’ll get plenty of for longer 8 to 9-minute plus efforts like “Ship of Doom” and the title cut (this scribe believing the latter a synthesis of Headless Cross-period Sabbath, Mandylion-like The Gathering and possibly Nightfall from Candlemass). Those concerned that you’ll be fighting monotone resting tempo boredom need to know that the guitar phrasing and versatility beyond Anders stellar singing raise the mighty hooks and melodies to fist banging, doom dancing motives that keep you returning for more. Smartly placing a slightly tranquil, exotic/progressive acoustic piece “Nattavaka” as a halfway breather, there isn’t a wasted moment on the record. If you desire fiery axe lead tradeoffs, check out the extended break for “The Devil’s Incubus”- while those who love the lurching, low tuned pounding metal, “Crimson Cross” will meet those desires. Seeing Candlemass be more prolific on the live front versus studio sessions these days, coupled with the disbanding of While Heaven Wept – we should consider ourselves fortunate to have Sorcerer fulfill all the epic doom metal needs the world desires. Bleak, classic, awe-inspiring – no telling where this group will take us next.